One of my previous posts stated that Harvard scientists came out with a study that showed sitting kills you quicker than smoking. A lot of people got upset with this research. The key is to remember that the people who were smoking were not living a sedentary lifestyle. If their job required sitting, they made sure that they got up every twenty minutes. They would get a glass of water, go to the bathroom, get a fax, go the office down the hall, turn off the AC, take a cigarette break, add paper to the copy machine, say hi to coworker, take a 20 second stretch break, and many other things that prevented them from sitting. The point is that they did not sit all day. When comparing them to people that never got up all day, they actually lived longer. It is not only sitting at work all day that is not good for you, it is also sitting in your everyday life. In addition to sitting at the computer everyday from 9 am to 5 pm, the people in the study would sit on the subway, bus or car to commute to work. Then they sit back on the subway, train, bus or car to commute back home. Then they sit down and eat dinner. Finally they sit on the couch and watch TV, sit down and spend time on their personal computer or sit and read the newspaper or a good book. They may even sit and use their phones for social media or YouTube. Then the weekend comes and they sit at the bar drinking, sit in the movie theater, sit at the opera, or they sit at a Broadway play. Almost every activity they did was done while sitting. 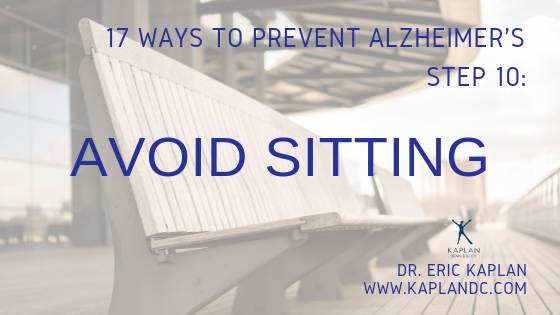 To keep your brain strong and healthy and prevent Alzheimer’s you must do activities that involve moving the body. Go ice skating at Rockefeller Center. Take a walk along the High Line. Play tennis in Central Park. Go to the Bronx Zoo. Instead of taking the elevator, walk up the steps. Instead of taking the subway, walk the 20 blocks. In NYC 20 blocks is one mile and will only take you 12 to 15 minutes which is basically the same amount of time if you were to take the subway. In NJ, when you go to the supermarket, park far away instead of close to the store to get more exercise. Start biking to places instead of driving. Walk your kids to school. When your children have a pool party, bring your bathing suit and swim. When your kids want to take their scooters out, run alongside with them. Take walks in all the NJ parks. Go to Demarest Farm and play with the animals. Take a walk in Emerson Woods. Take laps around the pond in Woodale. Hike the trail at Watkins Glen. Have fun! Go to Bounce U or Sky Zone and jump around. It’s great exercise and you are moving your body. In conclusion, remember to stop sitting. If you HAVE to sit, get up every 20 minutes. But even better is to choose to do activities where you do not have to sit.